Welcome to the live event page! 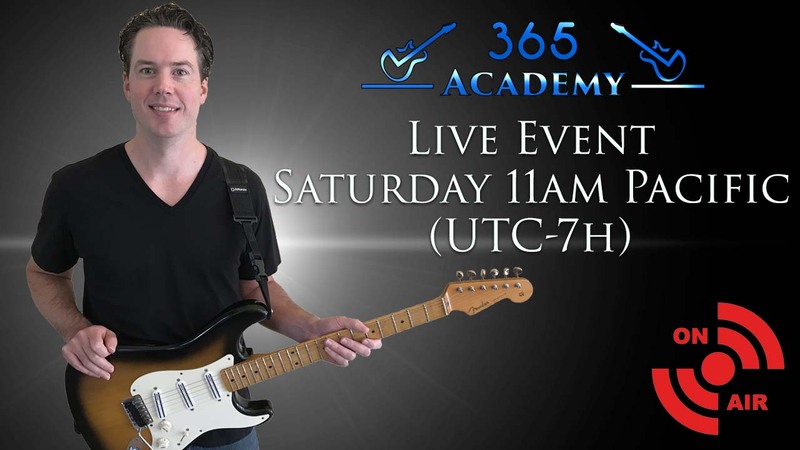 Every Saturday at 11am Pacific (UTC-8h) I will be here for a full hour in a live video chat to answer questions from any GL365 Academy members. You can ask questions about the lessons in the guitar courses of the academy, or just about any guitar or music related question you may have. This live video chat is a great way for me to answer your questions in real-time. Unlike the live events I do on YouTube where I can get over 100 questions per minute, these chats with only GL365 Academy members, will be a lot less crowded and low-key. That will enable me to get to your question. You will need to have either a Premium or Premium Plus subscription to be a member of the GL365 Academy and access this chat. If you haven't subscribed yet, you can find out all the info you need on the subscribe page. The chat will open about 15 minutes prior to the live event and close around 15 minutes after it ends. If you do not see the chat below, and you are a Premium or Premium Plus member, please make sure you are logged into your account. If we are live and you don't see the video stream or chat, please refresh the page. Click the play button on the video to see the live stream.